After months of hard work and renovations, we would like to officially welcome you to Riccardo Silva Stadium, the new and improved home of your Miami FC! 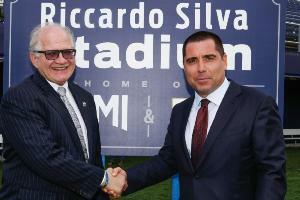 In an event at the new stadium on April 3, 2017, Florida International University recognized Miami FC owner Riccardo Silva for his efforts in bringing world class soccer to Miami by renaming the multi-purpose facility after Mr. Silva. FIU and Miami FC jointly showcased for the first time to media the installation of a new state of the art pitch. The new surface, Field Turf’s Revolution 360, features fibers that provide for optimal durability, resilience and feel and is used by many of the country’s biggest NFL and soccer teams. Also added was a brand new high-tech videoboard providing a huge boost to the fan experience at Riccardo Silva Stadium. Measuring 31×59 feet, the new videoboard will feature a 13HD pixel layout, the premier technology for outdoor applications within the sports industry. The new videoboard will have full live video and instant replay capabilities, along with multiple zones of content, including statistics and graphics.